No one is infallible, least of all me. It crossed my mind to surreptitiously not mention my big bad mishap of the day, but that would be awfully deceptive, don’t you think? If we can’t feel comfortable owning up to our mistakes, how do we expect to grow and learn? I AM A CARELESS IDIOT. I SHORTED MY BATTERIES. I AM THE REASON WHY THE DARWIN AWARDS WERE INVENTED. I WILL BE MORE CAREFUL FROM NOW ON. There, done. The air is clear. Now let’s give you the juicy details, because I know you’re salivating over the image of a burnt-to-a-crisp Christine roasted over 12 volt batteries. Jef and I had already connected the battery bank, and successfully turned on the mamma jamma inverter. That was definitely the high point of the day. We were too scared to plug anything into the inverter, but we got it to turn on and the display lit up. Yay. So then we knew that we had juice flowing, and we knew we had to be extra careful. We were connecting the small inverter, and everything was going fine, except that I intermittently wasn’t feeling well. I had started the day with a headache, felt some kind of tendonitis behind my knee, and occasionally my stomach felt queasy. Sake was barking incessantly at the contractor working on the neighbor’s house, and all these little irritants were starting to get under my skin. Not that any of these were to blame for my mistake, but it didn’t help. I surely wasn’t thinking with 100% clarity. Now I was struggling to insert an 80 amp fuse in the fuse holder, which happened to be only millimeters away from the negative bus on the 12 volt fuse block—bad placement, I know. The cover no longer fit the fuse block because of the cable configuration—also bad to let this slide. Wires were getting in my way, and my impatience was growing. Even my proctologist fingers (read: skinny) were too clunky to maneuver around the wires. I fumbled with the fuse, and then it happened. Sparks. The fuse that I was trying to insert grazed the negative bus on the fuse block. I instinctively dropped the fuse and pulled my hand away. I’m not really sure where the fuse landed, but my fuzzy brain figured that I had to move the fuse away from the sparky thing as soon as possible, so I reached down and quickly flicked the fuse away. I stared down at the bomb I had just created, waiting for it to explode. Nothing happened. I waited and stared some more. Is it just a matter of time? It happened in less than two seconds, and I’m honestly not completely sure what touched what. But I do know that sparks happened, and that I stupidly reached in to fix it with my bare hand. It took us a while to figure out what caused the sparks, but Jef finally concluded that, yes, I had shorted the batteries. 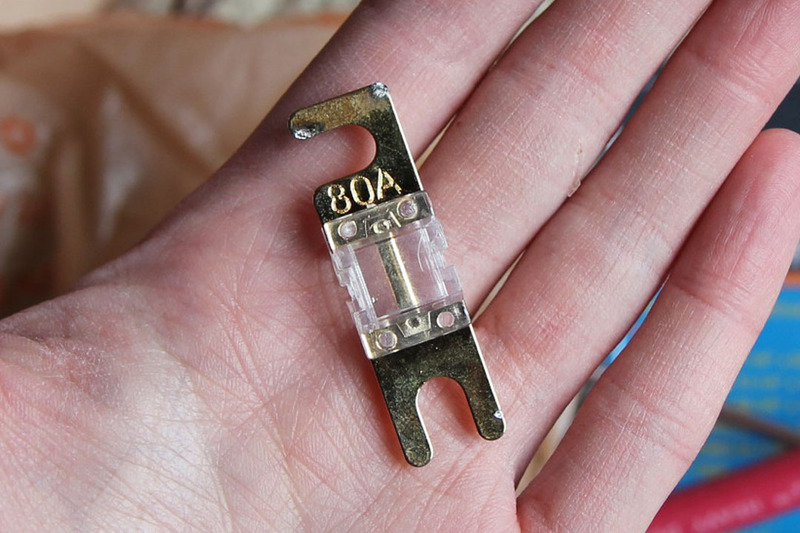 Incredibly, I did so with an 80 amp fuse … that didn’t blow. So, now that I’ve learned firsthand how dangerous this stuff is, and lived to tell about it, what can we all take away from this? Don’t place any positive terminals close to any negative terminals. Some of the devices I’m using have the positive terminal less than an inch away from the negative terminal, and seeing this kind of leads one to believe that distance doesn’t matter. But having a few extra inches separating positives and negatives is never a bad thing. 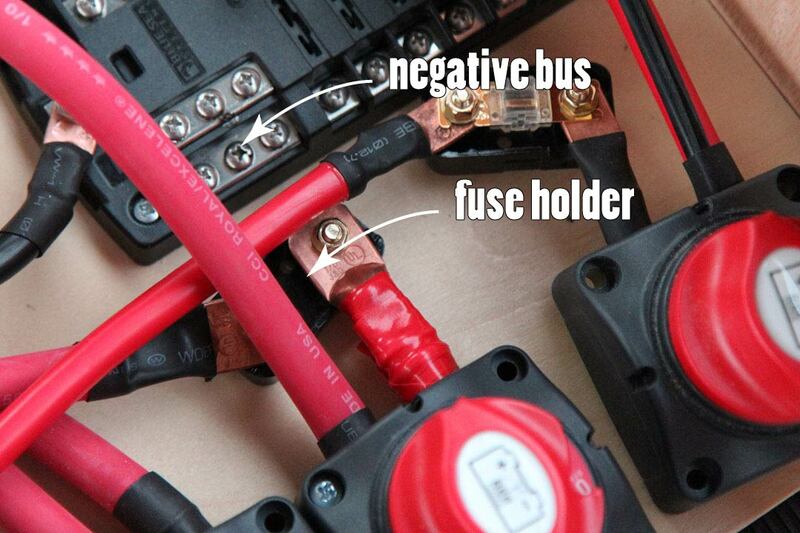 The fuse holder will be moved so that it’s no longer dangerously close to the negative bus of the 12 volt fuse block. Utilize the covers that come with devices. 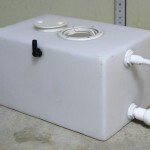 The cover for the 12 volt fuse block will be modified so that it will fit over the block even with a cable in the way. Insulate any exposed metal that carries current. All of Gypsy’s exposed electrical stuff will be soon be covered with Sugru. After my big goof I was in a pretty sour mood so we called it a day. If shorting your batteries isn’t a sign to wrap it up, I don’t know what is. Feel free to leave words of wisdom, tales of caution, or scornful reprimands in the comments section.